From left to right the first rising edge after the trigger (the vertical, light blue dashed line) is the A+ channel. Half way through the A+ pulse, a pulse from the B+ channel begins. A+ leads B+, therefore forward direction is indicated. 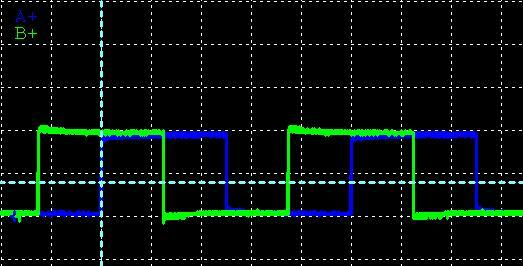 In both images there are two pulses transmitted for each count from the encoder. Each pulse has a rising and falling edge. As illustrated above, each optically resolved encoder pulse results in two rising edges and two falling edges – four transitions – seen by the length control system. 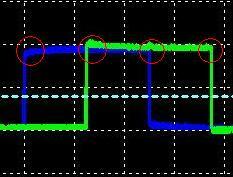 In this way, four counts are accumulated from one pulse of the encoder. Typically, you may simply multiply the model number of the encoder by 4 to calculate it’s post-quadrature pulses per revolution.